Microsoft Windows 10, 8.1, 8, 7, Vista, XP. GRBackPro Professional Windows Backup Software is optimized for speed and well integrated with the Microsoft Windows operating systems, both 32 and 64 bit versions. Because speed and efficiency are very important when choosing your daily backup software program, GRBackPro is written in optimized C++ producing highly efficient and very fast x86 and x64 native code. Customers have tested the efficiency, memory use, and resource consumption of GRBackPro Professional backup software, and have rated our backup software very highly. If you select backup software by basing your decision only on its feature list, even though you may not need all these features, you are making a mistake. Efficient backup software that not only works well and reliably but also comes with excellent customer support is a preferable backup solution. For this reason we have written GRBackPro software as dedicated and efficient backup software for Windows. GRBackPro allows you to save time and money�you will be able to quickly restore your data if your hard disk will dies (which will eventually happen) or if data gets erased in error. You will save money simply because time is money so GRBackPro will pay for itself very quickly. Data reliability is a major concern and GRSoftware offers a backup software solution that will give business people an edge over their competitors. With GRBackPro Professional Backup Software, our user interface is very simple and easy to understand. No complex menus and sub-menus to learn�you have all the options at hand. All the professional options can be quickly learned and used with just a few clicks. Of course we supply complete documentation but most people find they don�t need to read it all to be able to run backups. GRBackPro is fully featured backup software with many professional options built to solve any data backup problem. Although GRBackPro is a professional backup software it is also suitable for inexperienced users because it integrates a Backup Wizard that guides the user in setting up the program option. GRSoftware has been on the market since 1997 -- we are a highly respected, world-wide retailer of backup software and our support team is ready to quickly answer all your questions. We offer a 30 days money back guarantee - click to buy the right license immediately! 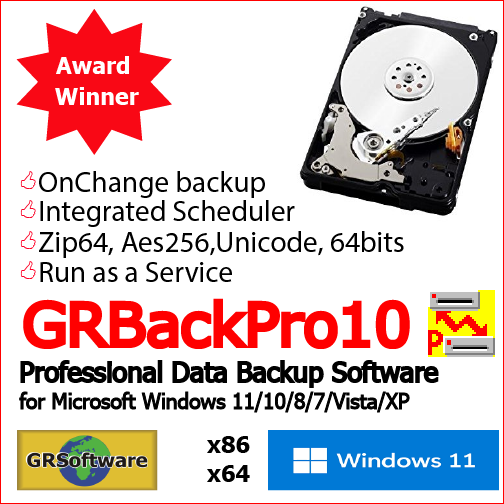 GRBackPro data backup software for Windows 10 / 8.1 / 8 / 7 / Vista / XP is professional Unicode backup software designed to quickly and easily solve any data backup problem at a low cost. Carefully designed to meet the new Windows 8.1 security specifications, GRBackPro supports both 32 bit and 64 bit Windows systems and requires Windows XP or higher. A new and customizable look and feel has been designed to make your experience even better than before. This new version has color gradients and effects that you can customize! GRBackPro supports network shares, hard drives, USB Flash drives, CD, DVD-RW, DVD-RAM, CD-RW (if you have a packet write driver), removable drives and any drive that can be seen as a drive letter under Windows Explorer (including some Tape drives). To create your backups you define multiple backup sessions each containing one or more different backup jobs. A backup Job lets you back up a whole disk, a single folder or few selected files using any combination of either incremental, differential (based on the archive attribute bit), or full methods. You can choose to do a simple copy of your files or to compress them inside standard Zip or Zip64 (if your files are bigger than 4GB) archives so that you can easily handle them using any archiving utility. You can install this GRBackPro Backup Software as a Windows Service to have your backups start even if you aren't logged in. GRBackPro has an integrated scheduler to automatically start your backup without intervention. Once programmed you can just forget it. This new version supports Windows Volume Shadow Copy so that you will be able to backup opened and locked files. Another new feature allows you to handle long path names up to 1024 characters and GRBackPro will manage Unicode file names, thus preserving your language characters even inside the zip archives. GRBackPro will span multiple destination disks so that you can easily build a multi disk backup set. GRBackPro supports Split mode to easily burn DVDs after the backup has been completed (this is a fast alternative to using packet write software drives). GRBackPro supports History mode that allows you to keep multiple backup copies. With GRBackPro Backup Software you can execute one or more tasks before and/or after the backup. This allows you, for example, to stop services that are locking files you want to back up and then restart them when the backup is completed. Other possible tasks can close an application, start a program, start and stop a service, pause the backup, issue a message box, end a process or send an email (with SSL/TLS support). This last facility lets you have your backup log report sent to your mailbox if any error has been found in the backup. GRBackPro lets you backup your registry files both locally (for an easy manual restore) or on the destination disk. A new automatic update facility allows you to easily update GRBackPro Backup Software. GRBackPro can be setup to check for updates at program start or scheduled the way you prefer. GRBackPro Backup Software has an integrated restore facility which allows you to easily restore individual files or whole backups and will quickly maintain two or more PCs aligned (Synchronization). Supports network shares, SAN/NAS, CD-RW, DVD-RW (packet write software driver is required), USB Flash drives, fixed and removable drives and any drive that can be seen as a drive letter under Windows Explorer. Tape devices are not supported unless they are visible as a drive letter by Windows. Can run as a Windows Service process and can logon to any specified account. Can span across multiple removable media. Supports Windows Volume Shadow Copy (x86). Zip64 zip archive format supported. Supports Full, Incremental and Differential backup modes. Can include or exclude files or exclude or skip folders. Can include all files, older or younger than a specified number of days. Supports long path names up to 1024 characters. Restore explorer to easily restore even single files. Execute or Close an application, Start or stop a service, Pause, Email a message, Display a message box, End a process. Powerful Scheduler with conditional backup execution is included. Wake-Up facility for when the computer is in sleep and a Scheduler event needs to start a backup. Support PKZIP 2.0 standard password protection scheme. Backup Wizard for inexperienced user is included. Backup and Restore Simulation to precisely estimate the backup size and test for errors. Allows you to copy files or compress them into a single archive or one archive per folder. Recreate exactly your source directory structure so that you can easily navigate into the backup archives. Synchronize your backup archives with your source files / folders. Easy to learn and flexible user interface. Runs in the background and is actionable from the tray icon bar. All backup activities are written to a detailed log file. Automatic software updater is included so that you are always up to date. Integrated email client to easily request support by email (supports SSL/TLS). A report dialog allows you to view, print and extract the activities. Language translations will be available for both x86 and x64 versions..
Windows Server 2016 / 2019 compatible. Two versions: x86 and x64 now available. Windows Volume Shadow Copy (VSS) support both for x86 and x64 systems. New customizable colors with effects. Zip AES 256 ciphered compression compatible with WinZip. New Add/Edit Job dialog. Many per session options have been moved at Job level. New user interface check boxes. Rearranged some tab options to improve logic. New Report tab. The log files are now separated to make them smaller and quickly handled. New Report tab. The number of log files to keep can be programmed. Added to the backup Job the possibility to skip folder names. Zip compression level has been moved to the backup Job. Option to move or copy has been moved to the backup Job. Clear Archive attribute option has been moved to the backup Job. Include system and hidden files option has been moved to the backup Job. Include file older or younger than N days options has been moved to the backup Job. Include wild chars specific files option has been moved to the backup Job. Skip specified wild chars defined files option has been moved to the backup Job. Skip specified wild chars defined folders option has been moved to the backup Job. Backup security attributes option has been moved to the backup Job. Added Run pause Task to allow networked computer to restart at a specified time. The "At backup completion do" option has been moved to the Scheduler tab that is now accessible during the backup. Many internal optimizations and bug fixes. Minimum Windows version supported is XP SP3 (for 32 bit versions only). Detection of the program that locks files with reporting on the backup log Report. New Report right click popup menu to capture log text and file/folder names to automatically skip. Online survey: Are we missing a feature you are interested in? Do you have any suggestion? Just tell us! Why buy the program license? You get one year's FREE upgrades to minor and major versions. You will get support for the version you buy until that version becomes obsolete. You qualify for First-class technical support. Our technical support staff sets the standard for quick and efficient resolution to a customer's issue. You will be offered a discount price for any major upgrade after the first year. You will be added to our e-mail list and alerted when minor and major new releases will become available. To use the program on multiple personal computers as long as you will be the only user. 5 Single User Pack US$ 270 Discounted price for 5 installations in the same organization. 10 Single User Pack US$ 500 Discounted price for 10 installations in the same organization. To use the program on all computers inside a single Organization. Buy our Windows Server backup software now at 2Checkout store! You can easily buy a license for this Windows data backup software using this order form. Can You Restore your Data? Data Backups: Test Now, Cry Later!